It’s always nice to know that you’re doing a good job. It’s even better when you’re doing such a good job that people want to rave about it online. 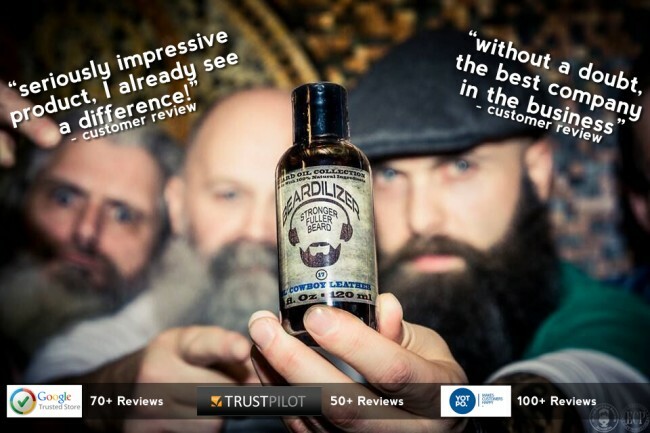 Beardilizer is beyond thrilled to say that not only do you beardos love our products but that Beardilizer is consistently given a four and five star rating over three different online rating systems! As a Google Trusted Store, we have an average five star rating! Yotpo and TrustPilot have four and five star ratings, as well. These ratings come from secure sources and allow Beardilizer staff to review and figure out what people like. It’s not that hard of a job when Beardilizer is getting nothing but fantastic reviews! Especially when becoming a Google Trusted Store is not an easy feat.The road to becoming a Google Trusted Store was long and hard but at the end of the day it was worth it because of how important our clients, you beardos, are to us. Its one thing to have a great product but it’s another to make the experience of checking out as easy and secure as possible. The stellar ratings from Yotpo and TrustPilot show that beardos across the board all love our products. All of the information provided to us concerning these ratings came from, as you can see, independent, trust worthy companies that always look out for the best customer service experience. That is just how important getting your feedback is to us. Having ratings this good from three different sources is a huge compliment to Beardilizer. We’re always so appreciative when we’re able to connect with our fellow beardos but this is a whole other ball of wax. Helping beardos grow betters beards and learn more about how to style their beard is part of the fun of operating a business like Beardilizer. In order for us to grow and help connect beardos across the world, it’s important that you guys are all happy. Happy beards make the world go around, after all. Growing beards so strong that they hold ties across the globe is in our nature. It’s just freaking awesome when we get positive feedback from our customers. The reviews that poured in from you all are amazing; everything from those noticing a huge change within a few days of taking Beardilizer supplements and/or feedback from people reporting improved thickness of their beard, bringing them that much closer to competition beard status. Having feedback from you beardos is great! It helps all of us at Beardilizer develop additional products so that we can meet YOUR beards needs. Every beard is beautiful and every beard is a unique snowflake. In order for us to maximize the bearded experience, reviews and ratings are absolutely critical. However, as best as we can see there is not much we can improve on since we’re already crushing it; however, we will always listen to your feedback, so please do send us comments or reviews to let us know how we are doing for you. Creating new products or even organizing events based on what our awesome customers tell us helps make Beardilizer stronger. We cannot say thank you enough for all of the fantastic ratings and for you dudes taking the time out of your day to write something nice on the internet. Beardilizer can only assume that our perfection is just that obvious.